Pakyow is an open-source framework for the modern web. Build working software faster with a development process that remains friendly to both designers and developers. It’s built for getting along. 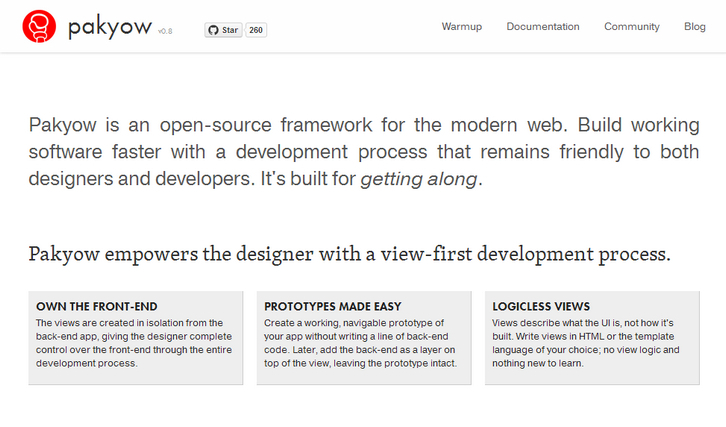 Pakyow empowers the designer with a view-first development process. The views are created in isolation from the back-end app, giving the designer complete control over the front-end through the entire development process. You can create a working, navigable prototype of your app without writing a line of back-end code. Later, add the back-end as a layer on top of the view, leaving the prototype intact.